Oklahoma Department of Transportation’s $600 million I-40 Crosstown deconstruction and rebuilding project replaced a major thoroughfare for those in the Oklahoma City region and those who use the highway as a national coast-to-coast interstate route. The project was completed 100 days early, saving time and money for motorists and residents in the region. The project was a catalyst for the city’s new rebranding and rebuilding plan for downtown Oklahoma City, while reducing congestion for commuters and motorists. 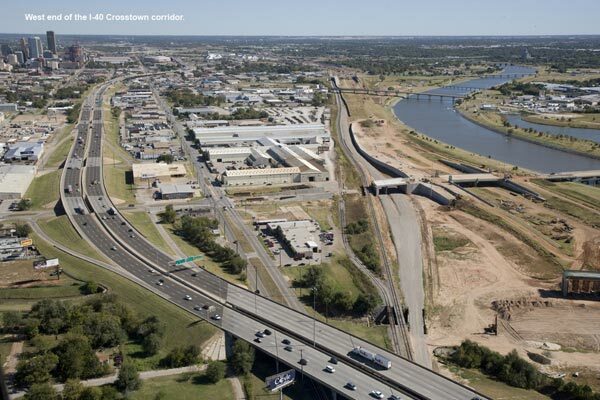 The Crosstown project aimed to replace the deteriorating bridge cutting through Oklahoma City with an expanded highway south of Downtown, providing new opportunities for development and expanding businesses in the heart of the city. New pedestrian-friendly boulevards as well as new home and commercial space construction are breathing life back into the heart of Oklahoma City as a result of the I-40 crosstown project. ODOT estimates the early completion and opening date saved motorists $1.3 million in road user costs, while also saving taxpayers over $1 million in maintenance costs from the old I-40 Crosstown.